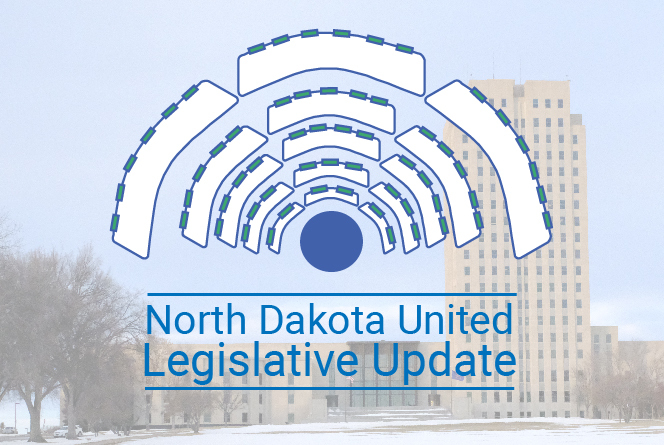 Welcome back for another week of North Dakota United’s Legislative Update. First off, apologies for opening this message by asking you about your impressions of the cold weather outside. Secondly, it is cold though, right? I’m not just imagining that? Certainly feels cold to me, and I’ve lived in North Dakota for 38 of my 40 years. The other two were in Minnesota, so yeah, I kinda know cold. This is it. Best way to get through the cold is to just push through. On to the business at hand! We kick things off this week with an unexpected bill, which would erase a mistake that was made by the Legislature in 2015 and shortened the period of time that teachers had to consider signing their contracts, from 30 days to 14. HB 1414 would reverse that decision, and increase that back to where it was. A hearing was held this past week, and NDU President Nick Archuleta testified in support of this bill. NDU President Nick Archuleta testifies against HB 1531 in committee hearing. We are currently facing a teacher shortage in our state, as well as across the country. There are a number of factors playing into this. The most important thing to consider is that fewer college students are pursuing degrees in education now than in the recent past. Why? Well, that’s the million-dollar question. Certainly, you could surmise that teachers are getting beat up a lot more now than before. Talk radio blames them for society’s ills. Popular culture, and pithy quotes like “Those who can’t do, teach,” diminishes their profession. The costs of attaining a college degree keep going up and up, and the salaries that teachers receive have remained stagnant. Teachers don’t feel like they’re valued, despite polling data that tells us they are respected and beloved in their home communities. How do we attract more people into the profession? Well, one answer is to lower the standards. Just hire anybody to come in and teach Little Tommy physics, and problem solved! Right? Every week, we’d like to ask all of you to help ND United to make our voices heard on an important issue. These past few weeks, we have been asking all of you for your help on HB 1347, a bill that would increase the probationary period for new teachers from one year to three years, and remove most of their rights to representation during that time. It’s a bad bill, in short. So far, 286 letters have been sent through our Action Network form directly to all of the members of the House Education Committee. And your voices are being heard, as the bill is being amended to take out language stripping teachers of their rights to representation and to receiving a hearing in front of the school board when their contract has been non-renewed. 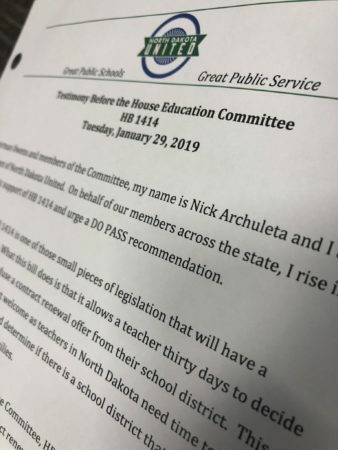 However, the increase of the probationary period for teachers still stands, and could go to a floor vote in the House this week or next. Your call to action is to go to our website and sign up to be a NDU Member Activist. When we know that this bill is headed to the floor for a vote, we will send out a new Action Alert that will allow you to send messages to the two representatives in the House from your home district. Tell them to VOTE NO on HB 1347. But sign up to be a Member Activist now so that you are the first person we contact when that Action Alert is ready to launch! In a spot of good news for the week, SB 2141, which would have set up “education savings accounts” for every baby born in the state of North Dakota to use toward educating their child, failed quite very badly in the Senate. That’s a voucher bill, but it’s gone now. Still standing, though, are a couple of bills in the House. One is HB 1464, a “study of the feasibility and desirability of developing a school choice program.” Translation: study of vouchers. And there’s HB 1321, “relating to an income tax credit for taxpayers whose children receive nonpublic school or home education; and to provide an effective date.” Translation: voucher bill. The 2019 North Dakota legislature is pretty well fixated on the PERS pension system. As we discussed last week, HB 1419 would have injected $20 million every year until … well, sometime … into the NDPERS defined-benefit retirement plan for state workers, with a goal of shutting down the defined-benefit plan for future hires and replacing it with a defined-contribution plan. In testimony, it came out that doing this would actually speed up the process of PERS becoming insolvent by 58 years, so we could take a benefit away from state workers. That bill got turned into a study by the Senate. 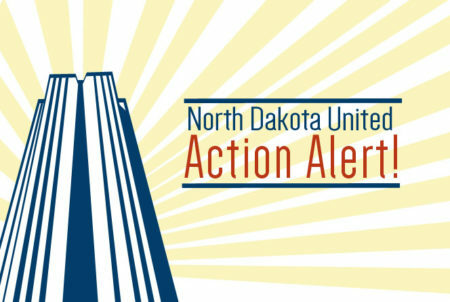 Three Senate bills on the PERS pension are coming up now for consideration: SB 2046, which would end the Employee Health Insurance Credit; SB 2048, which would increase employee and employer contributions into NDPERS by 1 percent, and help return the NDPERS fund to being fully funded in a gradual, responsible manner; and SB 2047, which would decrease the multiplier of the PERS plan from 2.0 to 1.75. We support SB 2048 because “we’re willing to do what we can to bolster PERS and do what’s right,” Archuleta said. OK, seriously. Even I’m tired of reading what I have to write. And I like me! A lot! Rapid-fire, here’s what’s upcoming. 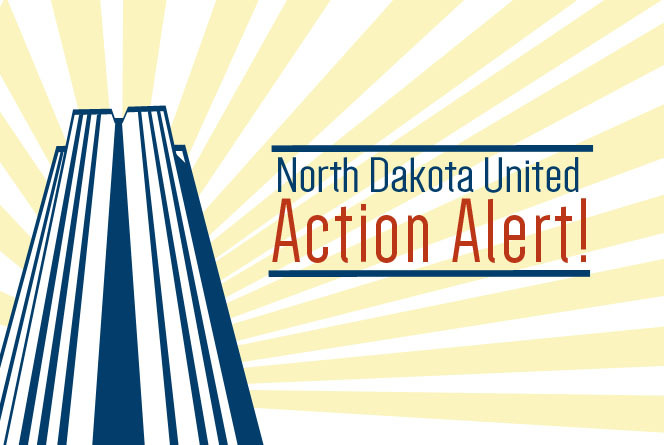 Are you currently a member of North Dakota United? I would like the option to get paid for PD or work in my class. Your district paid you your salary but NOT expenses including travel, hotel and registration, to attend the PD conference. Your district paid you your salary plus expenses, including travel, hotel and registration to attend the PD conference. I would not attend and would take the days off. If you’re a teacher and reading these words, do us a favor and fill out this survey, and let us tell the Legislature about how you feel about professional development conferences. SB 2320 — “Relating to free speech at institutions under the control of the state board of higher education; and to provide a penalty.” This is a gigantic bill, most of which is innocuous. But one section would regulate how higher education faculty can talk to students, and what information they can pass onto them. This is an unnecessary infringement on academic freedom. HB 1536 — “Relating to legislative authority to set tuition and fees at institutions under the control of the state board of higher education.” Basically, some members of the Legislature want to set tuition rates for our universities. And seemingly would like control over everything that is done on campus, probably including dictating what food groups faculty and staff are allowed to ingest during their lunch breaks. Oppose. 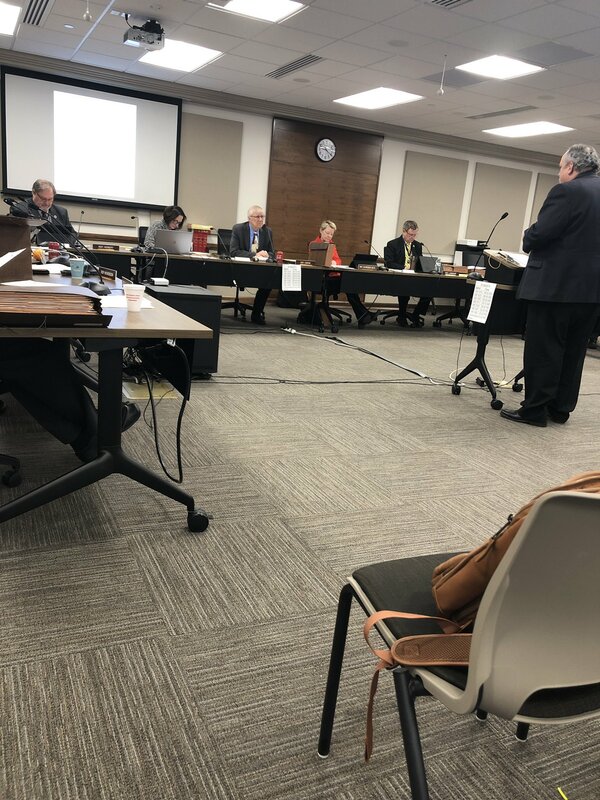 HB 1028 — “Relating to public employees retirement system self-insurance plans for health benefits coverage mandated health benefits; and to declare an emergency.” This would lay the groundwork for transitioning the NDPERS health insurance plan from its current hybrid status to being self-insured. We actually were self-insured in the 1980s, and that went belly-up. So, just be careful. Please. Done. I’ve been Kelly Hagen, your NDU Communications Director, with this written update. Please, if you have a free 20 minutes in the coming days, take that time to watch the video version of this update, featuring NDU President Nick Archuleta and Director of Public Affairs Tom Gerhardt. They do a great job, and spend a whole lot of time each week at the Capitol, talking to legislators on your behalf. If they weren’t doing that, legislators would spend way more time thinking about how they can protect straws and plastic bags, and less time thinking about recruiting and retaining the quality workforce we have in place in public education and public services in our state. I guarantee.